BHP Billiton’s 517MW Kelar gas-fired combined cycle power plant is being developed in Mejillones, Chile. Image: courtesy of Samsung C&T Corporation. The consortium of Samsung C&T and KOSPO was awarded the contract for the construction and operation of the Kelar gas-fired combined cycle power plant. Image: courtesy of Samsung C&T Corporation. 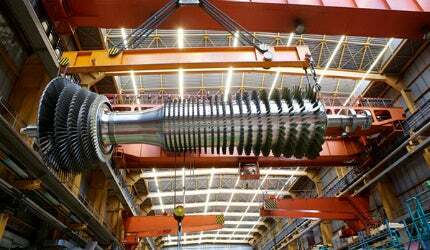 Alstom will supply two GT13E2 gas turbines for the Kelar power project. Image: courtesy of Alstom. BHP Billiton Chile, a subsidiary of BHP Billiton, signed an agreement with Samsung C&T and Korean Southern Power (KOSPO) in November 2013 for the construction of a 517MW gas-fired, combined-cycle power plant in Mejillones, Chile. KOSPO and Samsung C&T formed a special purpose company called KELAR for the development and operation of the project under Build, Own, Operate and Maintain (BOOM) mode. Groundbreaking ceremony for the project was held in August 2014, and commercial operations are expected to start in the second half of 2016. The total estimated investment on the project is $600m. The plant is expected to replace coal-based power generation in Chile, offsetting up to 1.5 million tonnes of CO2 emissions a year. Cerro Dominador is a 110MW concentrated solar power plant (CSP) being developed by Abengoa. The Kelar gas-fired power plant is the first independent power project in Chile to be completely undertaken by Korean players. KOSPO and Samsung C&T are the providers of equity investment whereas Samsung Engineering is in charge of construction and KOSPO will be the operator. The plant will consist of two GT13E2 gas turbines to be supplied by Alstom. The GT13E2 turbine features Alstom’s new Advanced EnVironmental (AEV) burner, which works on continuous fuel variation concept for more flexible and reliable operations. The turbine’s operation can be flexibly changed from performance optimised mode to maintenance cost optimised mode in order to reduce the maintenance costs. Liquefied natural gas will be supplied to the Kelar plant under a long-term contract made between Gas Natural Fenosa (GNF) and Minera Escondida, the Chilean company operated by BHP Billiton. GNF will supply the natural gas from Mejillones LNG terminal in northern Chile, which receives gas from the Sabine Pass liquefaction plant in Louisiana, USA. The first gas delivery to Kelar is expected in 2016, in time for the commissioning and commercial operation of the plant. The power generated by the Kelar plant will be transmitted through the northern interconnected grid (SING), to meet the demand of BHP’s copper mines and related mining operations in the Atacama Desert. The project is being financed through a $210m direct loan from The Export-Import Bank of Korea (KEXIM), a $170m commercial bank loan guaranteed by KEXIM, an $89m uncovered commercial bank debt, and $32m letter of credit and working capital facilities. The $441m engineering, procurement, construction, and commissioning contract of Kelar plant was awarded to Samsung Engineering in January 2014. The plant construction will be carried out on a Lump Sum Turn Key (LSTK) basis. Alstom was awarded a contract worth more than €100m (approximately $107m) to supply two GT13E2 gas turbines along with providing long-term service. Doosan Škoda Power will supply a 177MW turbo set for the gas-fired plant. Doosan sub-contracted AUTEL for the control and protection system of the same. South Andes Capital provided financial advice to BHP Billiton for the project. Natixis acted as the financial advisor and Mandated Lead Arranger (MLA) to the consortium of KOSPO and Samsung C&T. Natixis participated in the project as part of a group of commercial banks that included KEXIM.